Exclusive vouchers for a free camera with any new Vodafone contract. Vodafone are offering this rather awesome waterproof digital camera with exclusive voucher codes when you take out a new contract. 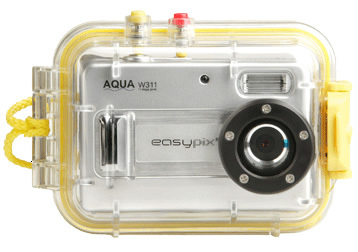 The Easypix Aqua W311 is perfect for summer and can be used in the pool or sea to a depth of 15 meters and can shoot video as well as still images. The camera retails for around £70. To receive the camera free you simply need to order any phone with a £35 or more per month 18 month contract or a £30 or more per month 24 month contract. It is also available with any 24 month mobile broadband contract. Copy the voucher code you need, visit Vodafone to make your order and then paste the voucher code at checkout to add the free camera. All 24 month mobile broadband contracts: uwcamera3a"